Aid agencies in a large cluster of refugee camps in northeast Kenya are limiting their activities and distributing only basic services — food, water and essential medical care — after two aid workers were kidnapped while working in the area. Two Spanish aid workers were abducted and their driver was wounded Thursday while working near Ifo camp, which is part of an extensive network of camps in Dadaab, Kenya. More than 450,000 people are housed in the sprawling camps, which are located near Kenya's border with Somalia. Hundreds of staff have been confined to their offices, forcing the cancellation of services like education, counselling and relocation of families until further notice. "Only water, food and health services are being maintained," United Nations refugee agency spokeswoman Needa Jehu-Hoyah told The Associated Press. "This will of course have an impact on the poor refugees." Kenyan security forces, meanwhile, have found an abandoned vehicle that was used by the kidnappers, mired in the desert 30 kilometres from the Somali border, a police officer who requested anonymity said. Officials say it appears the militants were headed towards Somalia. Kenya has deployed troops and six helicopters in an attempt to rescue the pair, who have probably been forced to continue on foot with their captors. CBC's Carolyn Dunn noted that that Dadaab camps, which were established roughly 20 years ago, provide more than emergency shelter. "There's literally a generation of young adults who have been raised in this camp, educated in this camp, and so there are lots of programs beyond emergency aid," she said from Nairobi. Jehu-Hoyah said the ban on non-essential movement for UN staff and their partners from aid groups would remain in place until further notice but that the UN was working closely with the Kenyan government to improve security. She said more police have been deployed and extra checkpoints set up. Security has long been a concern at Dadaab, where representatives from various factions seek to recruit disaffected young male refugees as fighters. Aid workers live in guarded compounds surrounded by high barbed-wire walls, and the UN requires its staff to travel in the camps with armed escorts. UNHCR representatives are expected to meet with elders from the Somali refugee community and Kenyan security authorities to try to improve security at the camps, Dunn said. Other aid organizations working in the area, including CARE, are limiting activities. "The only ones going out are those who perform life-saving services," CARE spokeswoman Juliett Otieno said. "We don't know how long it will last." 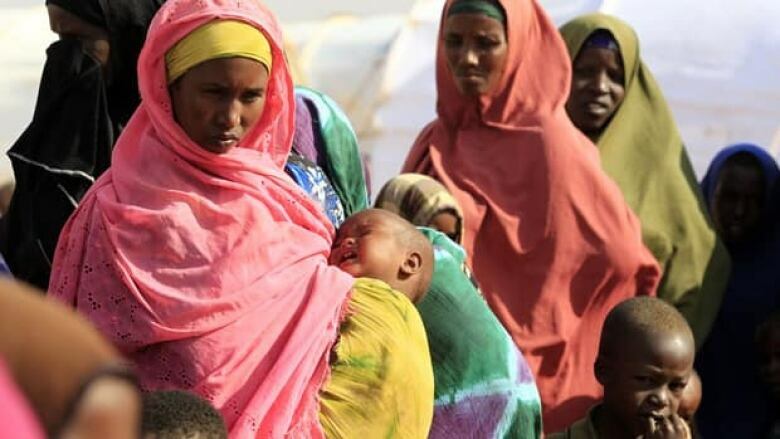 Millions of people in East Africa are facing a serious food shortage that has reached famine levels in parts of Somalia. Antonio Guterres, the UN high commissioner for refugees, condemned the kidnapping and appealed for the safe return of the aid workers, who worked with Doctors Without Borders. "I appeal to those responsible to facilitate their immediate and safe return," he said. Investigators have launched a ground and air search for the missing workers.